It's a simple question for most people but not 2008 Indiana State University alumnus Chris Penn and his girlfriend, Gina Valdez. "Everywhere, I guess you would say," Valdez said before she and Penn took the floor to talk to a few dozen current Sycamores about their story and how today's social media tools allowed them to begin making side money by posting videos of their travels to YouTube. The couple, who have been traveling in their RV for the past few years and have attracted more than 47,000 subscribers to their channel, Chris and G Travels, shared their story and the benefits of the effective use of social media in today's digital world during a presentation Tuesday. Penn's interest in travel started during a study abroad experience in Australia while he was an Indiana State student. He also would discover during an internship in college that a 9 to 5 lifestyle wasn't for him. Penn, who grew up in Montezuma, purchased a van and began traveling after graduation. Since August 2015, he has been working with Ishaan Vadhera, a Master of Business Administration student and director of the ISU Student Marketing Company, Sandeep Bhowmick, assistant professor of marketing and Vernon Sweetin, assistant professor of marketing, to improve his digital marketing efforts using Basecamp, an online project management software, to help him go from 31,000 to more than 47,000 YouTube subscribers. "They're digital marketing entrepreneurs who travel to beautiful places and make a living because this is such a fascinating time with so many social media tools that allow them the freedom share their travels and make money," Sweetin said. Penn's initial plans after graduation were to travel to Southern California then to Alaska. But the cost of van repairs left him stranded in Arizona. He spent nine months working and met Valdez, who now travels with him. The couple records their travels and established a YouTube channel to upload their adventures, like summers spent in Alaska. They recently generated an additional mobile income by leveraging the YouTube channel and other social media platforms within RV industry businesses by shooting videos to teaching people about the different products. "I've been able to meet other people through the social media channels who are doing similar things with their travels," Penn said. "When I find companies to work with, I look at their online reviews because I do not want to be tied to something that's not quality since I show viewers exactly what products do." After their brief stop in Indiana to visit Penn's family in Montezuma and visit his alma mater, Penn and Valdez planned to fly back to Arizona on Tuesday evening to get their RV. "Our goal is to go back to Alaska for a while, but from there, we don't know yet where we'll travel next," Penn said. "Everybody thinks they have all the time in the world to do what they want to do, but that's not the case. Life is short and you're freer today than you'll ever be. I didn't have the foresight after I studied abroad to see how traveling could be a job. It really wasn't until I bought a van after college that I thought I could do this as a lifestyle." Penn's learned that social media can be undervalued, though, and told the students they will need to explain how the new platforms can best reach customers where they communicate. "Students today are incredibly lucky to be in college at this time with all of these tools that help to open the world to allow them to do anything, anywhere," Penn said. "I see the value in these tools and what they allow us to do when I get comments on our channel that we've inspired someone to get an RV or when people say they travel vicariously through us." 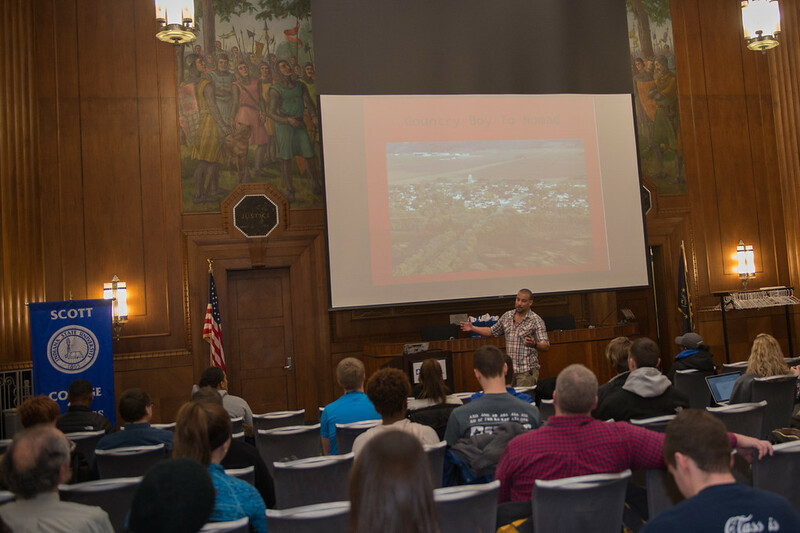 2008 Indiana State University alumnus Chris Penn and his girlfriend, Gina Valdez, spoke to students about their travels in the U.S. and how today's social media tools allowed them to begin making side money by posting videos of their travels to YouTube.